In 2009, I asked people with rheumatoid disease (PRD) to list the first symptoms of rheumatoid arthritis they had experienced. Over 800 people have commented, simply listing their first symptoms. 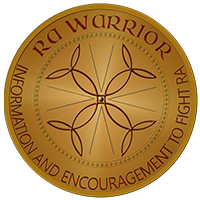 There are also dozens of Onset Stories on RA Warrior. Our experiences with early symptoms of Rheumatoid Arthritis are clues to how the disease starts. Following that breadcrumb trail could lead to understanding more about triggers and causes of rheumatoid disease (RD). 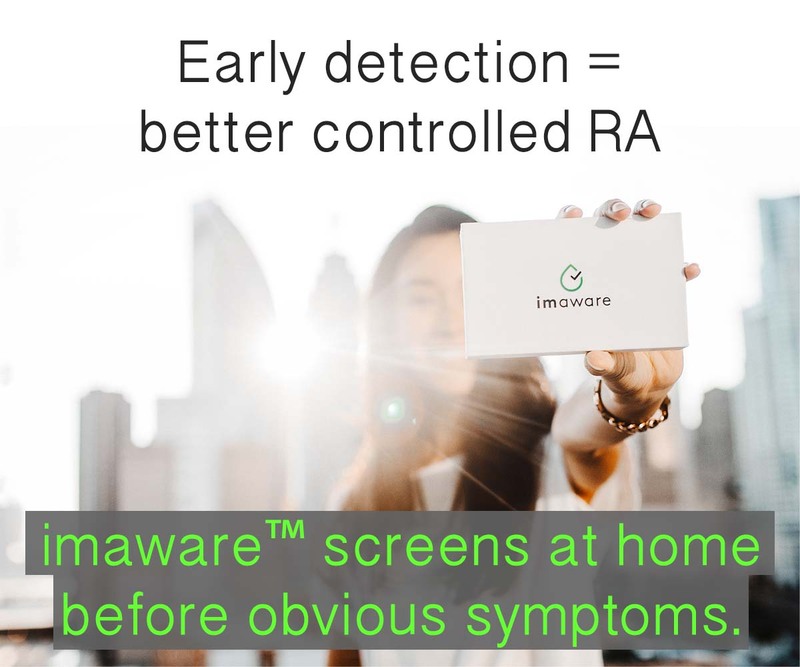 Let’s look at 15 early symptoms of Rheumatoid Arthritis, according to patients’ comments on RA Warrior. 1. Inconsistent joint pain: People with rheumatoid disease (PRD) commonly describe joint pain that seems to move around as it affects new joints over a period of days to months. RD can affect any joint, small or large: feet, fingers, ankles, wrists, knees, shoulders, hips, jaw, spine, ribs / sternum / costochondritis, or sacroiliac joints. Joint pain can be mild, however pain is often severe and PRD describe it as sharp pain, stronger than pain from injury. 2. Persistent joint pain: PRD experience joint pain that persists in specific joints. Pain may be present in single joints or multiple joints. Any joint may be affected (see #1). 3. Fatigue or malaise: PRD often describe sudden unexplained fatigue that interferes with daily tasks. Fatigue from illness is like exhaustion after working, except it occurs without the work. 4. Fever or flulike symptoms: Low-grade fevers are common (up to about 100.5 F). PRD also experience other flulike symptoms such as achiness and a feeling of being ill.
5. Joint swelling: Joints swell slightly or grossly, suddenly or gradually. Joint swelling is inconsistent and variable. It does not necessarily correlate with other symptoms. 6. Eye inflammation, dryness, or pain: Several eye symptoms and diagnoses are reported by PRD including iritis, uveitis, episcleritis. The Mayo Clinic story below describes a case of severe scleritis as an early symptom of Rheumatoid Arthritis. Sjögren’s syndrome is also common with RD and included with early symptoms of Rheumatoid Arthritis. 7. Stiffness: Stiffness can occur in any or every joint. Stiffness can occur at any time of day despite the common reference to “morning stiffness.” When stiffness is severe, it can be impossible to move around. 8. Tendon symptoms: Tendon symptoms are very common and often diagnoses separately, especially when they are early symptoms of Rheumatoid Arthritis. PRD report tendon tears, tendon inflammation, and tendonitis (which may sometimes be tenosynovitis according to recent studies). 9. Weight loss: Weight loss is a serious symptom of severe or very active RD because of increased resting energy expenditure and the nutrition loss caused by lack of appetite. 10. Rashes: PRD report rashes, redness, nodules, or other skin abnormalities as early symptoms of Rheumatoid Arthritis. 11. Vasculitis: There are several types of vasculitis that can be related to RD. Skin vasculitis has been reported by many PRD. Rheumatoid vasculitis is a serious symptom of RD that has been believed to occur only in well-established RD. 12. Lung involvement: It’s well known that rheumatoid disease can affect the lungs, and some research indicates it may begin there. Lung problems reported by PRD include several diagnoses such as rheumatoid lung, ischemic lung disease, pulmonary sarcoidosis, pleurisy, inflammation, lung nodules. 13. Cardiac involvement: There are several ways rheumatoid disease can affect the heart. PRD describe inflammation of heart lining, “heart disease,” and various heart procedures as related to their early RD experience. 14. All joints at once: PRD have reported whole body flares in which all joints are painful and stiff. 15. Other joint symptoms: Joints may feel warm or look red, or they can look larger even though there is not soft swelling. People with rheumatoid disease say rings become too small. PRD also experience a variety of uncomfortable joint symptoms such as weakness, or a sensation of pulling or heaviness. 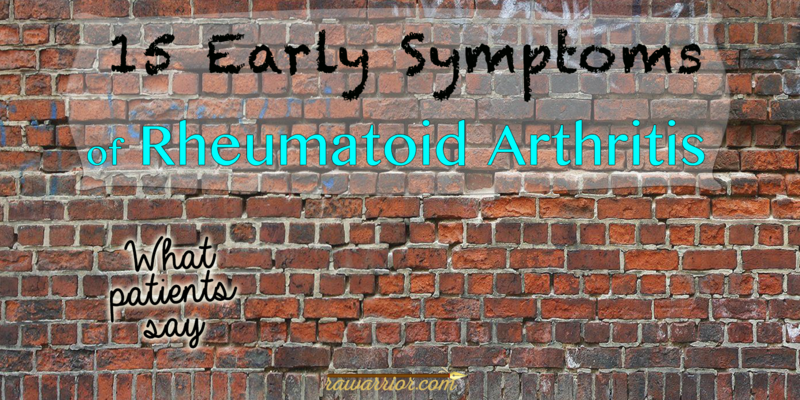 What early symptoms of Rheumatoid Arthritis did you experience? Are yours on the list? Post your early symptoms in the comment box below. NOTE: This list was created from patients’ reports to RA Warrior. There is no suggestion of the precise incidence of any item on this list. Some resources are provided below. They don’t do this to cancer patients. When my friend Dave had kidney cancer, they treated his broken leg and his lung and everywhere the cancer affected him. It’s tougher to diagnose kidney cancer in the lung, but doctors don’t refuse to. Yet RD isn’t treated or even diagnosed until it develops precisely the way rheumatologists think it should. Sandy saw 8 different doctors who didn’t suspect rheumatoid disease was causing her blinding eye inflammation… Continue reading Where the Rubber Meets the Road or What If Only the Cancer in Dave’s Kidneys Was Treated? How I became aware of the DIP RA debate: I hadn’t known my hands were being politically incorrect. I didn’t know the wrong joints were affected. I didn’t know not to go to the doctor when they didn’t look swollen enough. “That’s when I traveled to another state to get an ultrasound that would show the RA that affected my hands more every day. That’s when I met Dr. DIP, who told us…” Continue reading Does It Matter Whether Rheumatoid Arthritis Affects DIP Joints? My RD hit me like a brick all at once. But I always had viruses that may be hints. Fever blisters (Herpes Simplex) since I was very young. “Runarounds” on my fingers, HPV which led to Cancer. Cytolomegavirus which is a definite immune system problem. Also. Tore ligaments left knee in 6th grade and cartilage same knee when I was 17. Don’t really know if these are precursors or not. Thank you again Kelly. 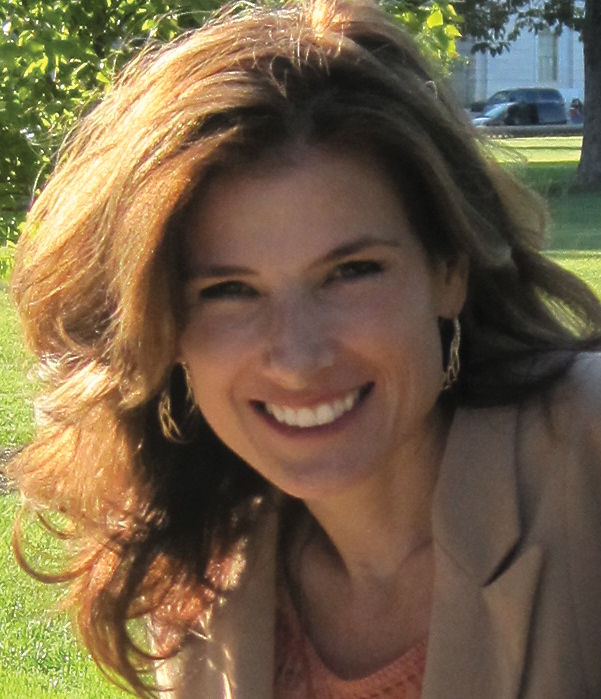 I was 9 years old when I had my first symptom – though did not know it at the time. My hands would fall asleep while I was sleeping, tingling so much they woke me up. I had to move my pillow to the end of the bed and sleep there, hanging my hands over the end of the bed so they would “wake up.” A few weeks later my knees swelled up. And shortly after that they hurt so bad I had to walk on crutches. Oddly enough, for me it was that the bottoms of my feet would burn. If I wake up and they’re burning then I know it’s going to be a bad day. I first noticed it in my feet (felt like they were broken when I would go to kick my shoes off after work), swelling and lack of movement in my fingers (they were almost claw-like when I would wake up), and lastly, stiffness in my neck (I’d be unable to turn my head side to side or nod it without severe pain and pressure). Had extreme fatigue as a teenager. Abcessed teeth. At age 13 and 15 then at ages 19 and 20 periodontal disease. Then later had pleurisy, bad flu, upper thigh muscle pain. Went to a doctor 3 months after turning 21 due to the unexplainable pain. He diagnosed Polyarthritis. As it worsened with just pain pills he sent me to a Rheumatologist, diagnosed Rheumatoid arthritis. And the nightmare began. Gold shots, steroids high doses of aspirin just to start. My first symptom was my feet. I thought I was bare foot too much and that was making my feet ache. Woke up one day and both hands hurt and were swollen. I went to my Primary Care physician for routine thyroid blood work and told him about my pain. He picked up on my symptoms and sent me to Rheumatologist. I am very grateful and lucky he was on top of it. It only took me about 4 months to be diagnosed- I was 38. Im learning to take it one day at a time and I am glad I have a place to “talk” to people who are experiencing the same thing. Thank you Kelly! At age 28 I had a severe case of mononucleosis- which for years I stayed severely exhausted. I seemed to get a lot of unexplained rashes, mostly on the trunk of my body. I now have confirmed Grover’s Disease, which is a rare autoimmune disease. At age 32 I was diagnosed with IBS and suffered with that until 43 when RA was confirmed. I went to the doctor in October of 2013, I was 59 yrs old, at that time my fingers were hurting, what made me see the Dr. was one day at work I felt a sharp pain in my left hand and it swelled. My primary care doc sent me to a Rheumatologist at that time I was diagnosed with inflammatory arthritis. At that point it started affecting my feet/ankles, my eyes dried out and so did my mouth. I’ve also developed Raynauds. I tested negative for Sojourners syndrome, I also began seeing an ophthalmologist. I am seronegative. I asked him to do an ANA test on me because my daughter asked him to. While I tested high enough for RA to be confirmed, it was not high enough to be Lupus. Two years later it’s in my hips, hands are worse and so are feet. 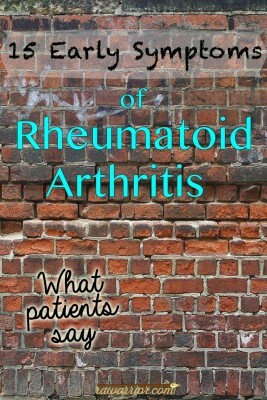 I’ve been to two rheumatologists, they both think I’ve had it for quite some time. I haven’t been on meds for just short of a year. I’m afraid I’m going to have to go back on them. I had a scare over a year ago when my brother died of bone cancer caused by the meds of Hepatitis C treatments. I know I have to get past that, but it’s hard. Sorry this is so long, I started typing and couldn’t stop. My first major symptoms were brain fog and dizziness. I had other symtoms going on but put these down to over training. The first symptom I was hit with was extreme fatigue. I went from swimming laps for a solid hour to barely being able to manage fifteen minutes at a much slower pace. I was diagnosed almost immediately with Hashimoto’s hypothyroidism, but all my labs were normal for everything else. It took another three years of pain and fatigue and complaining to the variety of doctors I saw before the RA was found by an orthopedic surgeon who ordered an x-ray of my wrist. She took one look at it and immediately said, “That’s rheumatoid arthritis.” It took three years of damage to my body before I could get any of the other doctors to listen. So much for an early diagnosis. And still, six years later, all my lab results are normal. My initoal symptoms were pain and stiffness in my neck, shoulers and hips. This remained in these areas for approximately 15 months. After starting treatment, within 2 months my feet, ankles, hands and wrists were fully involved. I really believe that Dr’s and Scientists really have no idea what causes AI diseases in general. More money is needed for more researcg to be done. It is great that they know it is related to overactive immune systems, however, leaving our treatment options down to using immune suppressants drugs is a joke given the risks we take using these drugs continuously. Having to weigh up the risks of agreeing to treatment and not receiving any benefit from them or receiving great benefit from them but putting our lives at further risk by using the drugs continuously. Really seems to be a no win situation. I thought I had dislocated my shoulder. Then my hands started to hurt gradually at first one finger then it spread to others. Then my entire hands felt as if someone was standing on them all day. Mid 50’s here. Mine started in 8th grade. I had such a hard time running in gym class, my teacher would get mad at me and make me go around the track another time. Next time I noticed was 5 years later, chronic fatigue & knee pain. Dr thought I had CFS. Fatigue came and went with knee pain. It took years of complaining to my Dr before he ran blood tests and said..sure hope it is not RA. Well it was. Sure explained a lot. Chronic knee pain, many bad disks in my back, chronic fatigue, chronic joint pain. Starting last year..loss of balance with middle ear issues. I ofter wonder if I had started treatment earlier I might be in better shape. I was in my 40’s before I was sent to a Rheumatologist. I had a slightly odd ESR reading for years and ‘fluid retention’ in my ankles. GPs could not work it out (to be fair could have been anything). Then sharp pains in my wrists that I attributed to rsi from library shelving. Then I couldn’t stand up for more than hour from fatigue, constant ankle pain (tendonitis and joint), stiffness, and low grade fevers. By this point I had gone to the GP and told him my suspicion it was RD. He tested me for inflamm markers and RF. Rang me a week later to say I had appointment with Rheumatologist … and voila. I did, in very early stages. Still get most of those diffuse joint pain, swelling that is not swollen, horrific fatigue, muscle pain, flu like symptoms (when I push too hard)..
My very first system was my right arm. They’d put it in a sling & give me muscle relaxers but never helped, this happened twice. Sent me to a bone doctor who told me I had RA so he sent me to see a rheumatologist. I was 32 when diagnosed, I’m now 50. I’m on disability and feel like my life is not my own anymore. It’s an ugly disease, just eating at every part of your body. The pain is excruciating. My first symptoms were in my feet. I could barely walk after getting off work. I bought new shoes and tried many things that didn’t help. Then my hands started hurting and joints awelling. I had no energy and ever thing was a struggle. I woke up so stiff. Nothing helped. My PCP listened to my symptoms, thought it sounded like RA, blood tests including titer for RA positive. Sent to rheumatology doc. I was 43 years old. I had burning sensations running up both arms. Doctor prescribed pain meds., which didn’t help. That’s when I was sent for blood work. The pain was so bad, I couldn’t even push myself up out of bed in the morning. The burn would dissipate, but it would be around noon! Every morning same thing. My first flare up i was 22 i believe…and it started in my ankle. I paid it no mind because i thought it was due to the fact i was sleeping on the floor until my new mattress came…so i limped around and it stretched from weeks to months. And then i thought maybe i did something to it because i sprained it once before when i was much younger….started working at Golden Corral. And it became much worse. Both my ankles hurt. Was hard to stand for long. Hands started hurting. My ankles and hands would swell up really big. By this time i was 24. Still paid it no mind. Figured it was from the work i was doing being i hadnt worked in awhile. My body wasnt use to the labor. Yet it was getting worse. Now im 26 and had decided to finally see a doctor. He said that my test lit up for RA. Like i had done research and came to the conclusion i had some type of arthritis. But actually being told i had it was a slap to the face. And i thought to myself my life is really over. So now my rheumatologist has started me on meloxicam and methatraxate 15mg each. Which is taking forever to kick in. And folic acid due to the anemia this RA has given me. Ugh. Before then i was just taking aleve which worked fine for me. But i had to change jobs. Golden Corral was to much. So now im doing a more light duty job. I can say it is a struggle having RA. And at such a youbg agr. I feel like my life has been taken from me because im not able to do things i was able to do a few years back. But i pray about it and im to independent to alloe RA to take over my life. So i keep going and im going to keep going until i cant anymore. I refuse to let this change me and have me thinking no i cant when i know i can. I have been getting some new symptoms and am wondering if it is related to RA or possibly the sign of a new autoimmune disease (I have RA and Lupus). When I yawn, the ligaments in my left wrist (most heavily affected by RA) twinge and I feel pain. Is this a typical symptom or should I mention it to my rheumatologist? Does anyone have any ideas? My first sign was my ankle would hurt so bad to the point I couldn’t walk. So I went to two doctors and they did blood test and said I have RA. I wasn’t informed that someone of my age could have RA I’m only 25 years old I have always had problems with my knees because of my feet not having a arch but all this time I could’ve had RA. So since Feb2016 I have been feeling all the symptoms of RA. Showed up in my shoulder, hip, wrist. Had to ask the dr. For RA testing! Drugs are poison, now have other issues because never told side effects, quit taking too late, dr. Never checked my ovaries – found 7 cm cyst by accident, and eye sight thankfully monitored but also too late. My first symptom of what now appears to be psioratic arthritis was a feeling that my lower legs were disconnected from my knees. No pain just a very strange sensation when walking. A sensation I have all the time now, along with the pain! I started with pain and stiffness in my hands, knee, and feet which came and went and moved from one joint to another. This was in the early 1980’s. For a few years prior to that I had experienced palpitations from time to time, which I never connected to the RA, but now I’m not so sure. Over the years, fatigue has been my most consistent symptom. At 48 years old I was kneeling down to fasten base molding to a wall and I could not stand up! My knees were very week. Soon after I had morning stiffness, wide spread joint pain, and difficulty walking. The hand and foot pain had probably been going on a while but my job always left me sore so I did not really think about it. I fist started getting random joint pain at night. A hip, a shoulder, a knee. The pain was so bad I went to hospital an have painkilling injections as nothing else would touch it. After about 6 months the random pain would last up to 3 days at a time. After about 6 months of that I broke my elbow an was laid up for a couple of months an soon after that had healed it became 2 joints at a time. An ankle and shoulder. An Elbow and wrist. It calmed down for about a year but i started getting morning stiffness that took longer an longer to wear off. Then the bottom of my feet became lumpy an swollen an I felt like I’d walked 10 miles as soon as I’d got out of bed! By this time I was finally diagnosed with RA (after 18 months of lousy doctors an slow referrals) an I was put on sulfasalazine which worked for 12 months. I think my first symptom was chest pain in the late 1970s which was eventually diagnosed as idiopathic (unknown origin) pleurisy/pericarditis. I had this repeatedly for many years and finally figured out that it would occur whenever I did any aerobic exercise. I’ve had various inflammations, like plantar fasciitis, but it would usually be triggered by an injury or overuse. Several years ago, after a day of yard work, a single knuckle swelled up which didn’t seem to want to resolve itself. That’s when my doctor ran the blood test and found RA. My symptoms have never fit the “normal” RA symptoms (bilateral swelling, gradual onset), and are very mild compared with the stories I have seen here (for which I am thankful). I had excruciating shoulder pain one night. It was so severe and unlike anything I’d felt before that I went to the emergency room. They recommended that I go to a rheumatologist and this is when I was told I likely had RA. Wow Kelly what a wealth of information. I wish I did know my first symptom of Rheumatoid Disease. Thankfully not my primary care but my dermatologist did blood work and caught my Grave’s Disease I had dropped to 88 lbs the endocrinologist said there was no time to waste my thyroid had to come out this was early 2000’s Since I was involved in a motor vehicle accident in 1998 I was eventually classified as disabled in 2000 which my Dr faxed my place of employment because he knew that was the last thing I wanted. I had tried working from home etc. my RA factor was always showing five times too high the specialist here said it was a false positive because it wasn’t in my fingers. Thank God I was sent to Duke Hospital to the neurology clinic and rheumatology/Immunology clinics that being my hometown I knew I was in good hands. The Rheumatologist there is awesome he never spent less than an hour to an hour fifteen minutes with me. He explained autoimmune very thoroughly because RA was my third Disease that had been caught. If I had to name my first symptom it would be hips and spine. I’m unable to do the 3.5 hr drive one way any longer do he referred me to a classmate close to me. This Dr is good but compared to my original Dr there is no comparison. I started treatment 3 yrs ago first the methotrexate then the sulfer drug steroids you know the story. Currently I am on my third biologic and seriously considering discounting biologics all together. Since I have been on biologics I have stayed sick constant fevers, my sed rate is down, YAY!! The pain is still there and I was also listening to a Rheumatologist who said the biologics only help joint erosion 1 to 2%. My kidneys are now affected I’m in renal failure stage 3. Just need to cath once in awhile for now that’s all. My Vectra score was in the extremely high range 7 months ago and my last results done in December were even higher. My appointment with my specialist is the last day of this month. I will have read your full site by then and feel somewhat educated on my own since I have been researching it. I was informed about you from simply asking where I could buy the indigo and gold ribbon ? Maybe by next year I can make one. My wrist are very bad off. Thank you Kelly!!! Damn Krista! Your story is so similar to my own. In my case however it would be my hands and feet. And each night I would frantly wake in a panic and start rubbing sensation back into whichever had fallen asleep. I believe I was around 7 or 8 at the time. This lasted for many years. Being an 80s child I was in and out of the hospital because of one illness after another. When I was 5, I recall that I stopped eatting. This freaked my patents out and again I went back into the hospital. They never knew what was wrong with me. Still to this day I have Palendromic RA and all neg results. No one believes in my stair climbing weakness…my arms feeling like lead while washing my hair…yet my fingers continue to twist and the muscles in my hands are slowly disappearing. Appetites…I have no idea what that is somedays. Many of the symptoms of RA I have had..well except Rashes..I’ve never had rashes before. In this list they need to add restless and tingling legs. But there are so many symptoms to write down with RD…no wonder we are not believed. Love love to read your blog? Always is very helpful & inspiring to hear about life with this disease we share. I am not a critic of your work by no means, I love it but wanted to point out a typo to you. I am 57 yes old and my whole life has been one of pain fatigue digestive problems two bouts with mono my hands and feet would burn and turn red and purple when outside in the winter no matter what I would wear. In my 20s after 20 yrs batteling with the medical community diagnosed with fibromyalgia and hypothyroidism chronic fatigue reynauds everything but rheumatoid arthritis. Finally saw yet another rheumatologist twoontha ago and finally diagnosed with rheumatoid arthritis. Which I’ve suspected for decades. My mom had it my aunt has tow auto immune diseases diabetes runs rampant on my mom’s side. So now I am adjusting to this diagnosis and doing my own research n medications ect…. The past 7 years I have noticed a marked decline in my physical strength and mental clarity. Everything is a struggle physically more then it used to be. I associate with the first 7 and number 12. I have pain in my lung area. Eye problems, Fatigue, and flu like feeling. My G.P. is concerned because my body is full of inflamation. I am unable to walk well. I use 2 walking canes. I feel as if I am walking on a broken leg and about to give way. I can’t see my Rheumatologist for another 4 months. I feel neglected with no treatment or appt. for 2 yrs. I have detiorated and feel unwell most days. I am housebound and not able to get out of the house is causing me depression. I have just turned 70yrs. and wonder what the days ahead will be like for me if I cannot walk or get to appts. I am going to slowly die at home from lack of support. I wonder if anyone else feels as I do. Very isolated with lack of care. I was about 24 when first symptoms showed up. My jaw dropped as I read all responses- I had Mono in Junior High. So many of us noted Mono– I sit here wondering if it s a causal factor, or a symptom. Docs blew me off when I complained about my ankles- which are far worse than my hands, as are my wrists- so because it wasn’t my hands, it was not diagnosed until age 50 AND (oh joy) they charted that I had Munchhausen — which has followed me from chart to doctor as I moved from place to place- they ALL blew me off. I hate the entire medical “profession”. God help you if you try to learn anything on your own because THEY are too ignorant to find what is wrong with you! I finally walked into the Dr office and demanded blood work for RA. They tried to blow me off, and I had a fit until they finally did it. Ummm…yeah- RA.